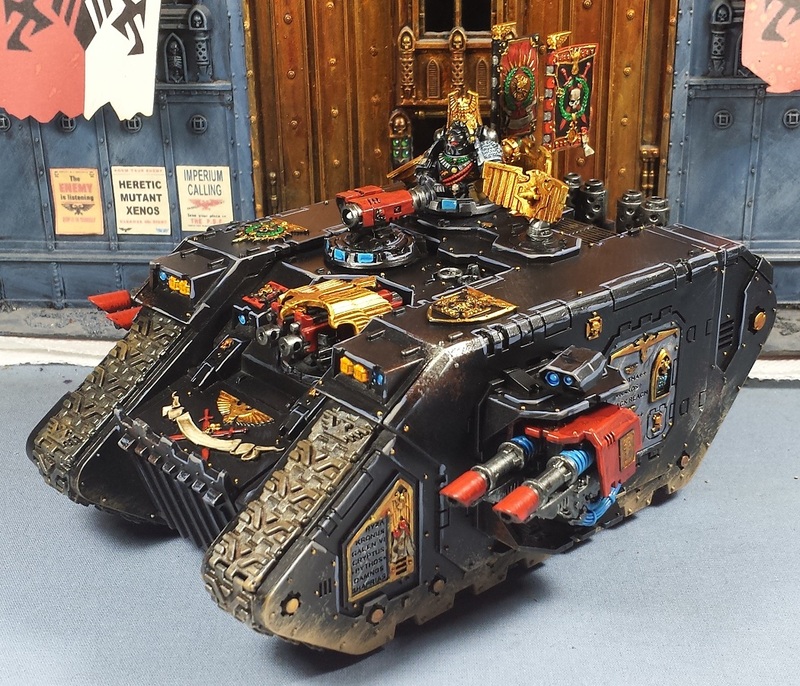 Mordian 7th Regiment: 40k Deathwatch - Land Raider complete and Dreadtober begins! 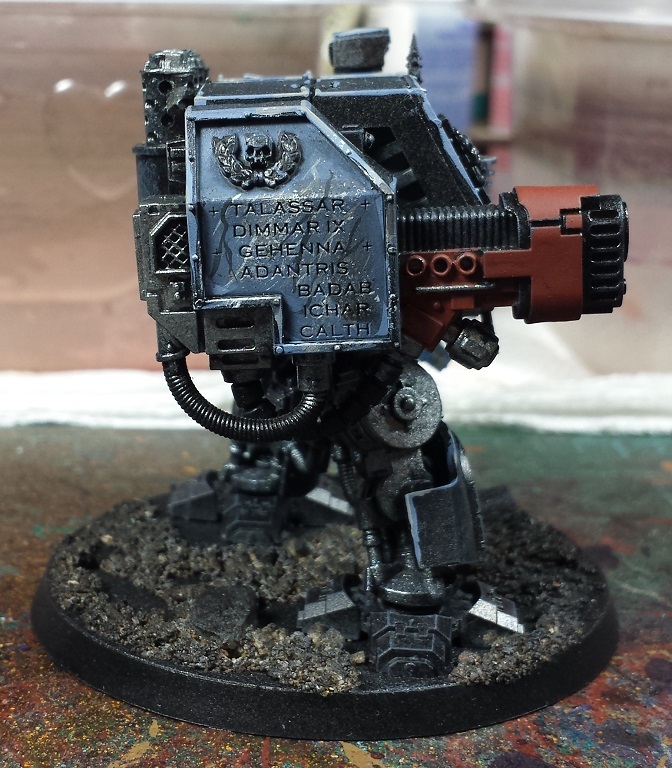 40k Deathwatch - Land Raider complete and Dreadtober begins! Got some more work done on the Land Raider over the last few days, and finished it off - took advantage of the nice weather to get it spray sealed. Phew! Got the blues on the power cables and lenses and the various parchment painted which really helped bring the tank into focus. Next up was some sponge weathering to rough in some paint scrapes here and there, then went with some feathered mud spatter along the lower section of the hull. The tracks got some mud wash and dusting as well, and I'm finally happy with the look! 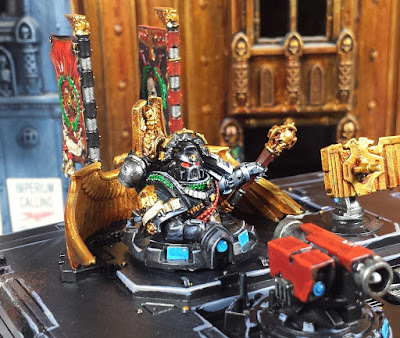 I especially like the tank commander model, though it isn't technically a deathwatch model it fits the aesthetic rather well! 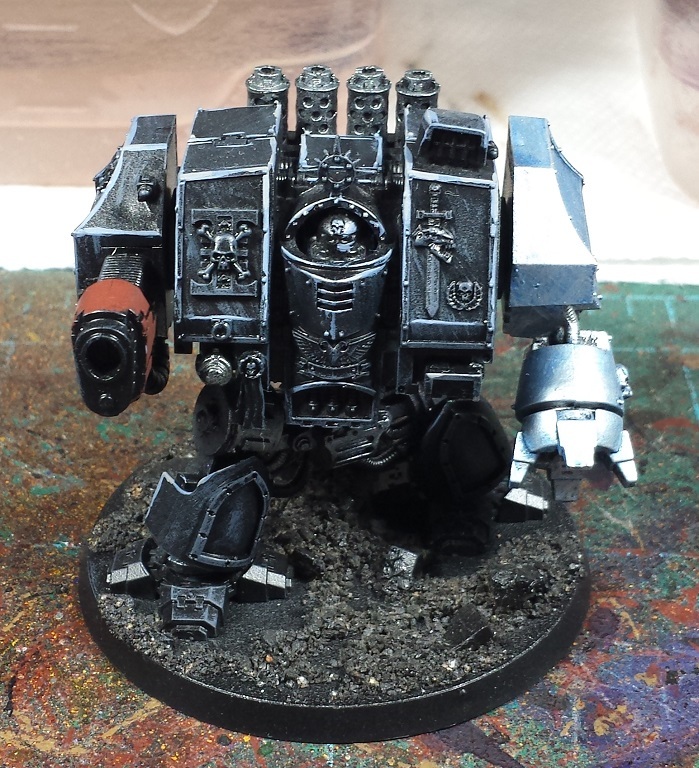 Next up was some work on the Venerable Dreadnought Brother Nihilus, seemed appropriate to get cracking on now that Dreadtober is upon us! Worked up the marble effect on his shoulder pad to match the Land Raider, and got the edge highlighting started - quite a bit of cleanup to do of course but I'm quite enjoying how he's coming along so far! In other news, as what should come as no surprise to anyone I'm diving in to the Genestealer Cult again now that the codex was released. 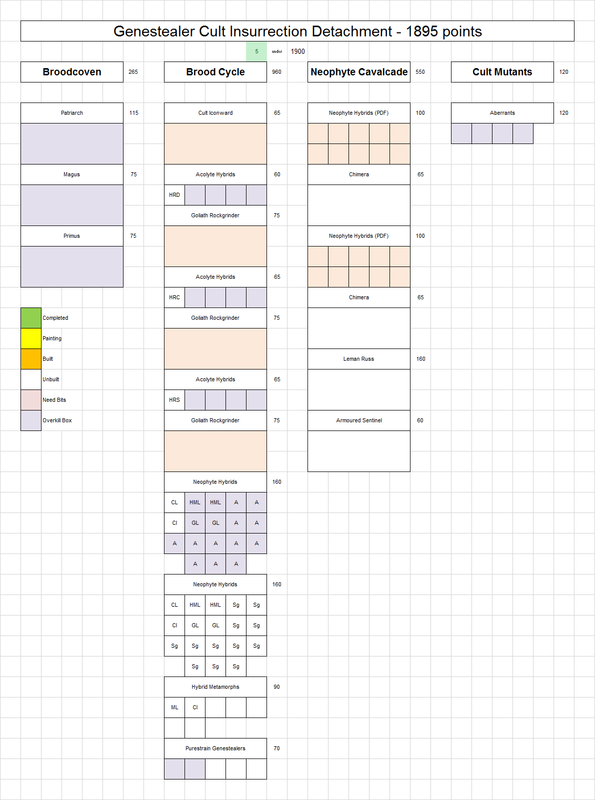 I've picked up the book and a pair of each of the new Neophyte and Acolyte boxes, and spent some time penciling together a list to work towards. I have the unbuilt models from the Overkill set lurking in the Closet of Doom, which I'm going to part out and came up with a 1900 point list - the intent is to build something to include the previously-painted Ghosar Cult and end up being a well-rounded 2500 point force. I have to say I was well pleased with this codex after the somewhat lacklustre Deathwatch book, and though I've said on many occasions that I dislike the formation style army building, I will admit that the Brood Cycle and Neophyte Cavalcade are quite fluffy and I am really happy to see the book allows for more integration of Guard/PDF forces. Quite looking forward to getting stuck in with the force, just as soon as I finish off the last of the Deathwatch for the upcoming Armies on Parade deadline! Man, that Land Raider is magnificent. Good balance of 40k battle-bling and that darker Deathwatch tone, so distinctive. Just superb work. Great work on the LandRaider. 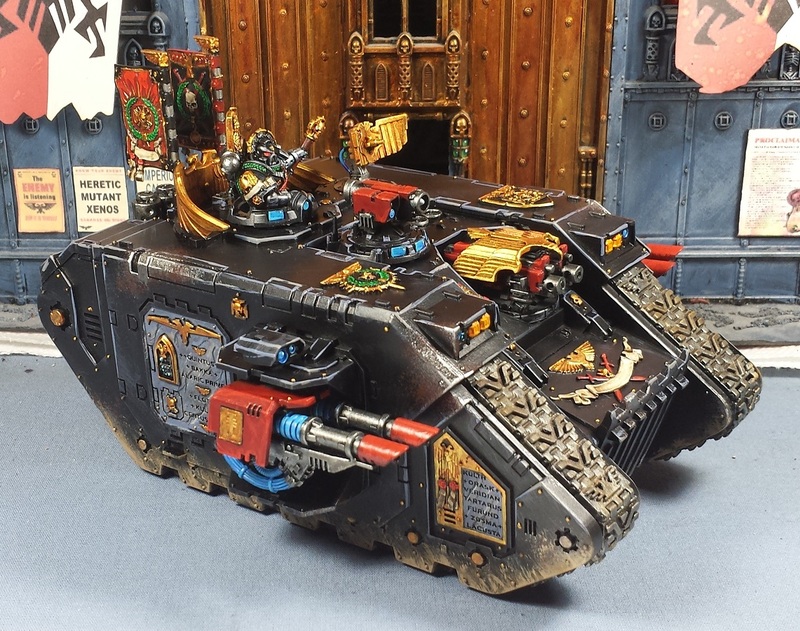 Fantastic HQ Landraider Mordian, and yes I expected you to dive into the new faction, lol. Look forward to your progress. Being a hobby butterfly myself, I am going to dive into the cult too, I have plenty of Space Hulk expansion from back in the day which includes Hybrids and tonnes of Purestrains, I think I'll also re work my few IG models and Leman Russes into the cult as I'd never use them otherwise. But unlike you, my progress will be somewhat slower! Yah for more Dreadtober. The marble effect is starting to come together there. Good work on the raider and all. Glorious! That marble effect is amazing and really helps break up all that black. The tank command looks ace as well. Great work on the deathwatch, they are looking good. I have to say I'm looking forward to more progress the genestealer cult, they have always had a warm fuzzy place in my hobby heart. I remember seeing the original cult and limo in my dads old WD collection when I first started playing way back in the early nineties. I'm a little sad they opted for utility vehicles instead of limos but I can understand why, limos are a little too old school I suppose to fit the current aesthetic. Keep it up dude. 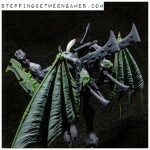 A dreadnaught is more or less a zombie anyway, so you score on the zomtober count as well. That tank is a perfect centerpiece model (oh, those marble panels...) and your dread is shaping up to be an excellent compliment! More armies, more Xenos scum - but at least they are the coolest ones. @Riot ville: Cheers! I'm itching to get started on 'em, all praise to the four-armed Emperor! @Siph_Horridus: I appreciate it - definitely looking forward to seeing your cult arise! @Joe B: Thanks! Definitely going to be doing some more marble work in the future! @Bronislaw Czevak: Indeed! I'm right there with ya, I too wished to see the return of the limo - would have been a nice nod to us old timers! @Zzzzzz: Hah! Double duty for Brother Nihilus! @Dai: Aye, I came around - it sat in the "this looks like garbage" stage of the painting process longer than most models for me it seems. The weathering really helped! @#2501: I'm planning on using the Goliath Truck stats and just call it unarmed, or gin up some civilian vehicle rules for home use. I sort of want to use a couple of the other 'combat cars' that WGE does as sentinels, perhaps!